If you’ve just moved here or want to go somewhere new, here’s the inside scoop on events happening around Lake Norman. Mooresville July 3rd Summer Celebration – July 3rd, 6-9 pm at Lowe’s YMCA. Enjoy fellowship, local entertainment & food, kid-friendly activities, & fireworks. Bring a blanket & chairs & arrive early. Event proceeds benefit the YMCA Annual Campaign. Queens Landing 4th of July Celebration – Queens Landing, Mooresville, 2-9 pm. 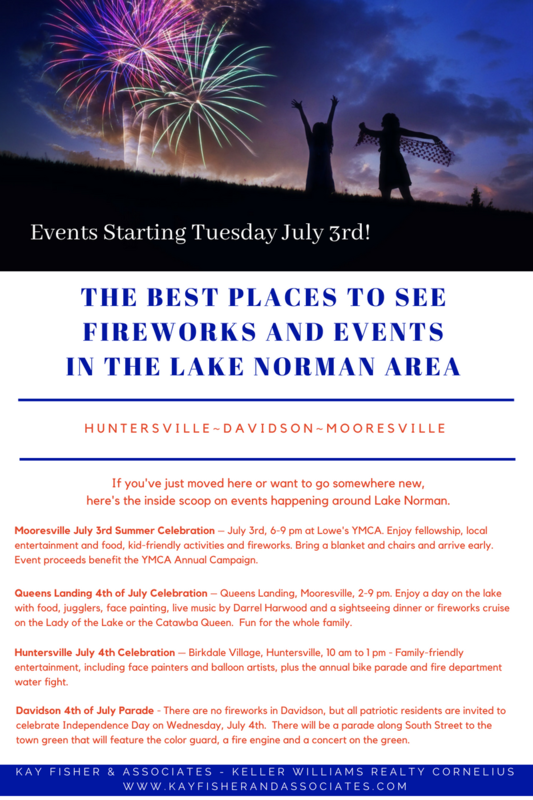 Enjoy a day on the lake with food, jugglers, face painting, live music by Darrel Harwood & a sightseeing dinner or fireworks cruise on the Lady of the Lake or the Catawba Queen. Fun for the whole family. Huntersville July 4th Celebration — Birkdale Village, Huntersville, 10 am to 1 pm – Family-friendly entertainment, including face painters & balloon artists, plus the annual bike parade & fire department water fight. Davidson 4th of July Parade – There are no fireworks in Davidson, but all patriotic residents are invited to celebrate Independence Day Wednesday, July 4th. There will be a parade along South Street to the town green that will feature a color guard, fire engine & concert on the green. 10024 Devonshire Drive- Just Listed in Birkdale on Golf Course!